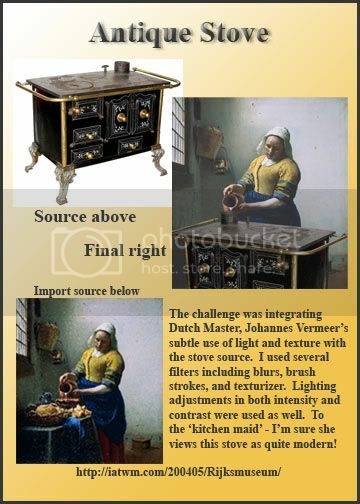 Modern Stove: I explored various filters to match the subtle lighting & texture of the 1658 oil painting by Dutch artist Jan Vermeer. Nice idea and well done. The top of the stove looks better than the front.. I think. Very nice, Cam! Nice matching! Whatever filters you used, they worked! Lovely! 1 Import: [img] i6.photobucket.com... Thanks for your comments. This was truly an exploration of many filters for me. Well Yomar, that's why Advantage is so nice because you can post your idea as you complete it. You've always got good ideas though!